Q: You always had a great relationship with Coach Osborne. DO: Yes. Well, I think. Maybe you’d have to ask him. When I started in the ’80’s and he’d walk into the training room there was this uncomfortable feeling, and I think he knew he made people feel uncomfortable because they’d be so intimidated. He’d go into the sauna and then people would come running out of the sauna. (laughs) I couldn’t figure out why, because he’s a nice enough guy and everything. Maybe this was my hardheadedness, but I couldn’t figure out why people were that way. Q: Soften him up a little? DO: Right! I remember the time when I first got to talk to him very much, he’d had his knee ‘scoped’. And I just kind of observed from a distance because he was dealing with George Sullivan. I can remember thinking, ‘We need to get this guy going, he’s not doing much to rehab the knee.‘ George went and put Coach in the whirlpool one day, and he’s sitting in the whirlpool. And George went in to sit at his desk and fell asleep. (George would take a mid-afternoon nap every once in awhile, and he was kind of long in there.) And after I watched the clock for a while, I noticed nobody’s going to talk to this guy and he’s been in the whirlpool for too long, now. ‘I’ll just go get him out of there. I’ll start doing some things with him.’ (laughs) And even with some of the athletes, they make you feel like, “Don’t bend my knee like that,” because sometimes, even scopes, you can lose that range-of-motion and it hurts trying to get that back. I thought, ‘This is what I do with an athlete. And if it’s good for the athlete, it’ll be good for Coach.’ And I started doing those things with him. So that’s how we started communicating a little bit. And I think he really appreciated the fact that I would treat him like anybody else. And I think directly then, which was helpful -these other guys in the late ’80’s and ’90’s- we had these characters, these personalities, that fit in pretty well, they could also see that he’s on the ground level with them, just considered him one of them. There was somebody that Coach would make fun of or tease (and of course they thought that was funny, because I’m ordinarily teasing them), so it showed them a different side of Coach, that “Hey, he can have fun!” I would just guess -and this is just an observation- but I would guess that the guys in the ’90’s would feel closer to Coach than the guys in the ’70’s or ’80’s. I don’t know if there’s an average age, where there’s a separation of age where automatically they’re going to respect you. Maybe in the ’70’s he was young enough and the dynamics were different, or maybe it’s just that they didn’t understand that he could be fun guy to be around and joke with. I really think the guys who came through, those personalities like Kevin Raemakers, Christian Peter, even Tommie (who let it be known that he wasn’t going to be intimidated by Coach), I think that changed the dynamics of the relationship a bit. Q: How would you describe Charlie? DO: Bipolar? (laughs) Charlie, you didn’t know where he was coming from or what he was gonna say. Coach Osborne described him one time, “Charlie is either all hot or all cold.” (laughs) So anytime you’re going to approach Charlie or be in the same room, you’re going to want to guage his temperature before you say anything to him. His players really loved him, those D linemen. Q: I heard nobody could motivate them like Charlie, getting them fired up. Were you ever around for any of those sessions? DO: Here’s a difference, too, between motivating with that old staff and how I saw Callahan and that group do it. And this is something, even if you’re a team captain and stuff, but to get up and give a motivational speech, most people just think that you get up and do a lot of yelling and rah-rah stuff and that fires people up. Well, Charlie seemed to me like his method was he was gonna tug at you emotionally, and he’s gonna start off and try to touch your heart, and it’s not gonna be yelling and stuff. It’s gonna be trying to get inside you, then maybe you’ll build where there may be some yelling or whatnot. (Of course, if it’s halftime there might be some yelling and such, but you’ve got to develop a rapport with the guys to have much effect on them.) Charlie giving his speeches? To yell, the kids just block it out after a while, but if they feel like you’re talking to them directly and they know you care about them, it’s gonna carry so much more weight. Q: Out of love rather than treating them as tools to get the desired result? DO: Yes. And Coach Osborne, when he would give motivational-type speeches, he always –it’s so simple I don’t know why people just can’t do it- but he was really, really good at not yelling. Because it prevents somebody from getting anxious, prevents them from making mental errors, it promotes performing at your top level by breaking things down to their most simplistic level. “Here, if we just execute this”, or “Here, if we attain this goal, no turnovers,” give very objective measures that they can see and they can get focused on, then you’re only dealing with what you can control and you’re not worrying about what the fans are doing, etc. He was really good at that. To me, that’s a no-brainer, you can’t just stand up and yell at somebody. “We’ve got to be able to run the ball!” What does that tell them? In his mind, it was like, ”We need to be able to run the ball. If we need to be able to run the ball, what has to happen? We’re gonna need Joel Wilks to have a really good game. And these blocking schemes here are going to work best for him, so if we can just get him coached up on how to take this step, and get things broken down to where he just has to perform this simple function, right here.” And it just takes all the static away. It’s just so much easier for kids to understand and perform out there. Q: Would Coach point people out like that, a certain person? DO: Not necessarily. You know, he came back and talked to one of Frank’s teams after he was done coaching. It was going to be a big game with all these distractions and they could have been wide-eyed and worrying about things they had no control over, and he just said, “Guys, today’s game is going to be determined in a space of about this wide.” And he held his hands about three feet apart. Now, young guys are going into this game thinking all these big ideas in their head that you really can’t put your hands on, and he breaks it down for them: “This space, three feet deep, the line of scrimmage,” he said, “on each play, you’re either going to go this much forward or this much backward. Whoever goes forward most times is going to win the game. Now you know why every play is important, why it’s so important to put to so much effort forth on each play. You can’t take a play off.“ He just broke it down that simply. And then, it was interesting because Coach, he was a great example of teaching from the proper aspect. This is an opposite example: Bill Callahan shows up here and Matt Penland wanted to be the Team Chaplain, so he was trying to meet with Bill Callahan. And talking to me, he wanted to know different things. I kind of coached him up on what I would see, what I thought, and he eventually starts meeting with him, and here is the #1 question he asked Matt: “What is the #1 form of motivation?” Matt was reluctant at first, “Why would he ask that?” He eventually asked, and Callahan said, “Fear. Fear is the biggest motivator.” That’s what he used. And I don’t know if that’s Lombardi, and maybe even Charlie at times, too. But just to use fear? You saw the difference. Callahan used fear, and Coach Osborne used love. Here is the prime example of why love is better (and I don’t know if Matt Penland ever got around to telling Callahan that): say, Paul, you’re standing outside your house and it’s on fire and you’ve got the Chief or Captain of the fire department standing there yelling in your ear, “Paul, go in there and see if there’s anybody left in the house!” You’re laying there, you may be worn out, burned up, lungs full of smoke already, and he’s gonna hold your job over your head to get you to go into the house. Is he gonna get you to do it? Maybe. Every time? Probably not. Now picture yourself standing outside there, same situation, but your children are still in there. Nobody’s gonna have to ask you or tell you, you’re not gonna just go through the motions, you’re gonna search and seek like no other. That’s the difference between fear and love. It’s very simple. Pretty easy to figure what you should do in the coaching profession. So you can’t be afraid to get close enough to the athletes, to show you care about them. Being genuine is part of showing that you care. Q: And kids can see right through it if you aren’t genuine in the first place, right? DO: Yes. And an interesting thing, the January before I got fired, this is after we’d been to the Cotton Bowl. And we had an okay season, but Running Backs Coach Randy Jordan comes down to the training room shooting the breeze with me every once in a while -and he went to my parents’ house one time while we were golfing and eating some hamburgers, that kind of thing- and he said, “Man, I just want to win! We’ve got to win! What do we have to do to win, Doak?” And I said, ‘Well, it’s not the trainer’s position to be saying, but you asked. So I’ll tell you my thoughts…’ I said, ‘Three things that Callahan and the team can do to really make a difference: 1) Coach Callahan has to act like he really cares for the guys. He can’t get up every few months and just say “I love you guys.” It has to be demonstrated on a daily basis by every one of you guys. 2) I said ‘Our defense is terrible. We’ve got to get back to where we want to hit people. And we’ve got linebackers who are stepping around blocks. That’s got to change.’ And 3) I said, ‘On offense we really don’t have an identity. We need to just get something that’s our bread and butter, so narrow down the playbook to where we can really get good at that part of it, and then add more later.’ And Randy said, “We’ll, that’s not gonna happen.” (The narrowing down of the playbook.) You know the ironic thing of it is? It happened in January, one month before I get fired. And they hang around one more year. And the funny thing about that, if he would have listened to what I had told the running backs coach, he probably would have been more successful. DO: Yeah. And so anyhow, it was time to leave and I’m debating, and I figured, ‘Well, I’ve gotta say this: “Coach, don’t forget what they say, ‘If you lose, don’t lose the lesson.’“ He was missing it. He was missing the opportunity to learn from it. He was just sitting around pouting. 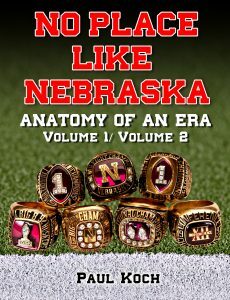 Part of it was the fact that he never wanted to be at Nebraska, and I think if he was successful he’d be looking onward and upward and get other offers somewhere else. That’s why I think he was so upset. And the Head Coach, you should held to a higher standard in the way you act, you need to look at the whole picture and think, ”How are we going to make this better?” I’m getting off on tangents here, but that’s a major difference in coaching styles and what’s truly successful. Q: Thanks for that. Tell me, what kind of schedules did you guys keep? DO: Well, an average day you’d get there at 7 a.m. and have a coaches meeting. Coach would need the report, the general discussion for the day, you know. The discussion could be, “How do we wanna set up our practice over Thanksgiving break?” or it would be, “Alright, we’re gonna have a life skills lesson, some general things.” Then you go down and do treatments ’til the noon hour, do whatever things you need to take care of in the morning, return phone calls, then you’ve got certain athletes needing to go to clinics, hospitals, dentist, get them to the different places. You do your treatments again, go to lunch, then you’ve got practice preparation, bracing, all that stuff, then you go to practice and take care of anything that occurs on the practice field, afterward you do more treatments, then after that doctors come in and go over things with the athlete, and then get ready for the next day. Coach Osborne had enough trust in me, I did a few other things. If there was a kid supposedly laid up in the dorm room I’d go check on him. Or if he was down in the dumps. Or if somebody was needing to go to the independent center because of a positive drug test or something. There was a lot of stuff there that was my duty. I think it was kind of by design, they wanted me to have some ‘alone time’ with them. Q: Kind of a mentor/mentee–type relationship? Q: A year later they could have called Santa Claus or the Easter Bunny, but you were the man he knew and trusted. That’s quite a compliment. What else about your relationship with Lawrence? So fall camp starts and Lawrence puts the pads on and he’s running with the scout team against the Blackshirts. He runs and breaks one a little bit, goes 7, 8, 9 yards down the field and there’s a big collision. You hear the pads ‘POP!’ And you say to yourself, ‘Okay, we’re gonna find out a little something about him.’ Some young guys, they get hit like that and shy away. And he turns around and starts coming back, and he’s got a big ol’ smile on his face. (laughs) I call Pat back and say, ‘He’s gonna be better that Derek and Calvin. You watch.’ (laughs) But my relationship with Lawrence started out like any of the other guys. You just treat ’em right and you kind of warm up to each other and get to know one another. I knew he had quite a temper. His temper and his hardheadedness was his downfall. I’d heard about him getting into some fights. But somehow we got to a certain level where he would trust me and respect me and we got along well. And one thing I remember, one of the running backs, a fullback, maybe it was Brian Schuster, a white guy from Nebraska was gonna get married: and all the running backs decided they were going to meet at the stadium on Saturday and decided they were going to go to the wedding. And all the guys show up except the black guys, and Lawrence was the only one to show up. He was the only black guy, right? So they’re sitting there thinking it’s going to be an uncomfortable deal for Lawrence and they’re giving him subtle opportunities to get out of it, ”Hey, do you want to call someone or go look for ’em?”, you know, give him opportunities to get out of it. And Lawrence was just, ”Well, they aren’t here. Let’s go.” So he goes. And to me, that’s a sign of character. You say you’re going to do something, and you do it. The deal with Kate McEwen was really overblown. It sure got a lot of publicity. It wasn’t like he was beating her head against a mailbox and all that. That didn’t happen. That whole night is a whole other story. I don’t know the name of the girl who called him up and started it all. Lawrence was the one that told me that some girl called him, and didn’t say who it was. But yeah, she was as much to blame for the whole thing as he was. Like I said, Lawrence had a very hard head and a temper. You’d see that sometimes, he didn’t really trust a lot of people. He was in a group home since he was thirteen and both parents probably had left him, and he wasn’t that bad of a guy unless you make him mad. You didn’t want to make him mad. 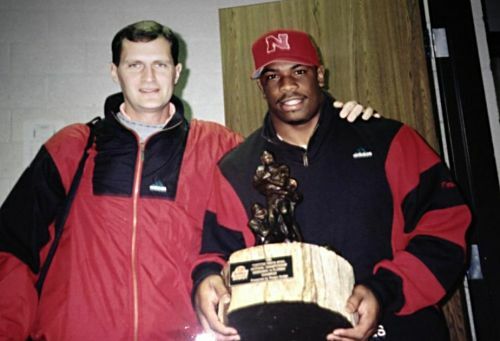 The one thing that people never quite understood, but Coach Osborne’s approach to these guys was, he would come to your house and say, “Paul, I want to recruit your son.” And he wanted you to feel like he would treat your son the way you’d want your son to be treated, so he’s gonna do everything he can for him, just like you’d expect. Not just use him up and throw him out if he’s not producing, football-wise. Everybody has value. So anyhow, when it comes to the Lawrence issue, working from that angle, he’d want the parents to approve of how the kid was being treated. And he also knew the only way to get Lawrence to do the right things was through football. If he didn’t have football out in front of him, he was likely destined to do bad things. Coach knew that, but he knew he was going to be criticized heavily by letting him back on the team. For Lawrence’s sake and allowing him back, he could make him go to anger management, alcohol counseling, whatever it might be. But if he gets kicked off the team he doesn’t have to do anything. Then you’ve got a chance to go on to play pro football and make some money. He didn’t want to take that opportunity away from him. That line of thinking had worked on numerous people, and there’s more success stories, but you don’t hear about them. You only hear about this because it didn’t work out. That’s what‘s hard for people to understand. They can’t understand Coach Osborne and that he would actually do something for the greater good than for himself, to win the game or whatever. That’s not the truth.